Hacking, destabilizing Western states, building up its military might, and weaponizing information – Russia is hitting the headlines and seems to be to blame for all of the world’s problems. One of the loudest anti-Russia voices is the United Kingdom, condemning Moscow’s actions and calling for economic sanctions against it. Most of the accusations are far from proven – so is there still room left for cooperation on vital issues between world powers? And now that the UK’s ally the US may be ready to change course and start making deals with Moscow, is there a chance for a change in tone? 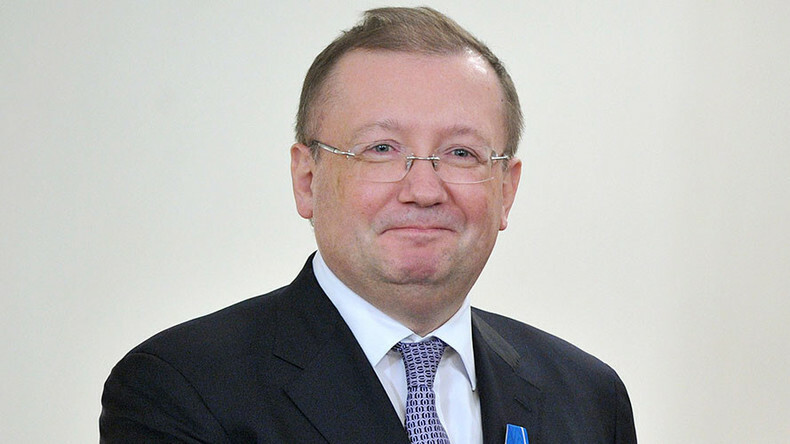 We ask Russia’s Ambassador to the United Kingdom – Alexander Yakovenko. Sophie Shevardnadze: Ambassador Yakovenko, it’s good to have you today. Today is Diplomat’s Day in Russia, so congratulations and welcome to the show one more time - it’s always a pleasure to have you with us. Now, Mr. Yakovenko, UK’s Foreign Secretary Boris Johnson most recently said that Russia is “up to dirty tricks”, and in the very same sentence he says it’s ‘folly to demonise Russia’. What kind of diplomatic gain is he hoping for? Will this strange twin-track diplomacy work out? Can the UK be confronting Russia and seeking cooperation at the same time? Alexander Yakovenko: Boris Johnson - by the way, we discussed this question a few days ago with him - he calls this “two-track approach”. What does it mean: it means that the UK is basically trying to deter Russia - this is first. But, on the other hand, they’re interested to talk to Russia on certain issues which are very important for Britain. So, Britain is sort of sitting on two chairs. I explained to the Foreign Secretary that it’s not so easy to do this. We would prefer the political dialogue - right one, and to discuss mutually interesting subjects and to develop cooperation. It looks like Britain is not ready for that yet, but we are patient, we can wait. SS: Sir Michael Fallon, the UK’s Defence Secretary blamed Russia for trying to undermine the West by ‘spreading lies’, ‘weaponising misinformation’ and even ‘creating a post-truth age’. Why do leaders in the West believe Moscow has more sway over their voters than their own politicians at home? AY: First of all, Russia is a brand and once you don’t engage Russia you look a little bit provincial, but as far as the statements of the Western leaders, I’d like to say that there’s no proof for these kind of statements, and every time when we hear something from London, we are asking for the explanations and we’re asking for the facts and we didn’t get any facts from them, and so we believe this is just fake news. This are just sort of fake statements. SS: Once again, Secretary Boris Johnson accused Russia of American election hacking - why is the UK getting involved in American matters? AY: It’s a good question, because the British blamed us - I mean, Russia - that we are one way or another involved in American elections. But it’s exactly the case with the British, because if you look at the most of the official statements before the elections, you will find that British officials supported the candidate, one candidate in the U.S. - that was Hillary Clinton, and this is just exactly what the British were saying about Russia. So, basically, the British establishment was on the side of one candidate and this is clear interference into the internal election processes in the U.S.
SS: British MP Ben Bradshaw says it's highly likely Russia interfered in the Brexit referendum as well. AY: That’s another fake story, because I asked Boris Johnson to present the facts - and he couldn’t do this. So, you can read a lot of articles about that in the British press, but no facts at all. SS: But more importantly, Ambassador, sorry to interrupt, but more importantly: what does Russia stand to gain from Brexit? AY: We believe this is the internal matter of Britain - this is first. Second, as for the consequences of that, of Brexit, we have to renegotiate trade agreements, because today we have trade agreements with the EU. So, the next step will be the new trade agreements. We didn’t start thinking of that because the process is not launched in Brussels - but this is the only consequence. So, a different trade agreement with the UK, but this, of course, will be the result of the negotiations. SS:You wrote once that the claims of “Russian interference in British politics” are a sign that Western elites are living in denial, trying to blame their shortcomings on outsiders - what can make them confront reality, in your opinion? AY: Good question. Because the country is divided. Half of the country believes that they have to go along with Brexit, the other half is opposing that. So, different points of view. For most of the people of Britain globalisation wasn’t a success, if you go outside London you will find that many people are suffering from the low salaries, from the low standards of the social security - they want changes. That’s why in this situation the politicians in Britain have to divert the attention of the public and Russia is a very convenient tool just to use as some kind of symbol, very important symbol that can divert the attention of the people. SS: As a response to the supposed Russian interference, the UK proposed NATO do more to counter the alleged misinformation spread by Russia - is the military alliance about to embark on an information war? AY: I don’t think so, it’s just… If you read the British press you will find a lot of proposals - how to handle Russian news, what we are presenting… and by the way, in the center of these accusations is Russia Today - which basically presents a different point of view and which is welcomed by the British public. I don’t believe that NATO will be part of that game, but who knows? The people who are working in this area, they are quite creative. SS: I wouldn’t be surprised if the channel named ‘NATO Today’ pops up anytime soon to counter Russia Today. Anyways, back to Sir Michael Fallon, who claimed that Russia threatens international security - but, and much like Boris Johnson – Fallon also said the UK should nevertheless engage with Moscow, including military communication. What do you think are the chances of successful military-to-military dialogue between the UK and Russia? AY: For the time being we don’t have any military dialogue at all. A year ago, when we just started the operation in Syria, we offered Britain our cooperation, and I personally had a conversation, a separate meeting with the former Foreign Secretary - at that time it was Mr. Hammond - and we proposed two things: the first one is, we offered the British to target together the terrorists and they refused to this. The second proposal was to work together with the representatives of Free Syrian Army to engage them in peace negotiations and the peace settlement. British side refused to do this. As I understand, our proposals are still on the table, but it’s up to the British side to decide how they are going to behave in this situation. What I want to say is that the peace process in Syria is moving, it’s moving without Britain, but we’ll be happy to have everybody onboard, because we need peace in Syria, we need settlement, and we need this country stable. We need the people of Syria as a future. SS:The Russian embassy in London responded to these latest statements from UK officials, saying that ‘there is a witch-hunt’ against Moscow because of Russia’s role in the Syrian peace process. But everyone wants peace, right? Doesn’t UK want peace in Syria? AY: Some people, they seek it in words. I’ll give you one example: humanitarian aid. You remember Aleppo, when the terrorists were holding the eastern part of Aleppo. There were so many conversations, so many cries here in the press, in official statements, about what was going on around Aleppo, and everybody was talking about the humanitarian aid. When Aleppo was freed, and now, today, we need the humanitarian aid in this part of the country - Britain is not supporting that. We didn’t have a single delivery from Britain to help the people of Aleppo. So, on words, yes, everybody wants to have a free and prosperous Syria - but we need the deeds. SS: Back in the summer, Secretary Johnson said that the Syrian conflict cannot be solved with President Assad still in power - now he seems open to the idea of Assad running for re-election. Is the UK’s stance on Syria beginning to align with that of Russia’s? AY: I’ll tell you, we’ve noticed this shift and I believe that this is the result of our numerous explanations to the British. We were telling them that they have to follow the democratic approach. These are the people of Syria who should decide who is going to run the country. It’s not in Moscow or in London or in Washington. It’s the people of Syria. We tried to explain this to the British and we see these shifts, but, still, it’s a long way to go. In order to help the process you have to do something in real life. We want to see the deeds, not just statements. SS: Britain’s Royal Air Force has been more active in the campaign against Islamic State than it was in Afghanistan or Iraq. You’ve called on the UK to fight ISIL together with Russia, do you feel London is doing enough on this front? AY: London could be the part of the coalition, and definitely they could be helpful in this area, but in order to do something, first, you have to talk and we don’t have any conversations with Britain on that matter, this is first. They should be engaged on that, and we don’t see that engagement, and we don’t see any signs of that. This is our task to engage as many countries as possible. We believe that Britain could make a positive contribution. I think it’s time to do this. SS: How can there be successful cooperation in Syria, when you hear comments like the Defence secretary’s calling a Russian carrier returning from Syrian waters “a ship of shame”? AY: I’ll leave it for the Secretary of Defence, these kind of statements. It’s just the reflection of the different approaches on how to handle the problems of eastern part of Aleppo. We believe that the best way is to free the people of Aleppo. The British wanted just the ceasefire, to conserve this situation. We believe that the Syrian approach and our approach was the right one, and history just showed that we were on the right side of history. As far as for cooperation… I think the first thing we have to do, we have to restore the political dialogue in order to explain our British colleagues what our plans in Syria are, you know, to engage them. Without the dialogue it will be very difficult to establish cooperation. That’s why, by the way, Lavrov invited Boris Johnson to come to Moscow and to talk a little bit more about Syria, because their meeting in New York, in September, definitely, half an hour wasn’t enough to explain what we want in Syria and the British definitely need explanations. This is first. Second, I think we could do something together in a different format, and that’s another opportunity for the British. So, we will be happy to engage the British, but it looks like they need a political will in this country to do this. For the time being, I don’t see any political will here. SS: Britain is sending its troops, aircraft and equipment to Estonia and Romania, as part of NATO’s military buildup in Eastern Europe; the biggest one since the Cold War. But it’s not like Russia isn’t moving closer to NATO’s bases, right? So why are we hearing the Defence Secretary blaming Moscow for ‘aggression against NATO’? AY: That’s a good question, because most of the efforts of the British, they are just symbolic ones - in Ukraine, in neighboring countries… We are trying to get explanations out of that, but the British, they like the symbolic steps and we believe these are absolutely wrong moves, because the security of these countries is not jeopardized, not at all. We believe that it’s time to revise the policy of the UK of having their troops just in front of our borders. It doesn't help the stability, and, moreover, it’s undermining the stability. So, we are going to work with the British on that matter. SS: At the same time Russia is upping deployment on its Western border. So how do you stop this arms build-up on both sides? AY: What is important is the dialogue. If you look at the Russian-American relations in the time of the Obama Administration, most of the contacts between the military and other contacts were just interrupted, and the task for the new administration is to restore these contacts. By the way, it’s also the task for the new British government which is run by Theresa May, because for the time being we don’t have any contacts. And then, after the discussions, after comparing doctrines and some other things, maybe we will come to some conclusions and some agreements which will ease tensions and improve the strategic situation in the world. SS: Fallon also expressed hope that "Russia could again become the partner the West always wished for” - what kind of partner do they wish to see in Russia? AY: Good question, because if you read the strategic doctrine of the UK, you will find that Russia is on the same level of threat to the security of the UK as ISIS. We believe this is absolutely unfair, and, first, we have to delete this kind of accusation, this is first, and, of course, we have to start dialogue. If Britain has any preoccupation with regard to its security, they have to talk to their partners and Russian readiness to discuss all these things is always on the table. SS: But what do they want from us? AY: What they want from us?... Good question. I believe that… so many things are changing in the world. Britain is trying to find its place in this changing world - by the way, Brexit is just one of the answers to this process - trying to find a new role in this world, and even for NATO, even for different military alliances this is some kind of search for new opportunities. Russia is an absolutely different country from what we had, let’s say, even 10 years ago. The economy is growing and you will feel it by the articles in the Financial Times. The army is very capable, you see this in Syria. So, Russia is a little bit different. I think, the British are trying to find new connections with Russia, but do not know how to do this. We know this secret, how to do this, we believe that it should be done through the cooperation, through the dialogue and just having normal relations. SS: The Independent reported that Prime Minister Theresa May offered EU leaders to be their “bridge” to Donald Trump - but they declined the proposal. Do you think that was wise on their part? AY: I’m quite sure that Britain is interested in good relations with the U.S., despite the very hostile British media attitude towards Trump. This is in the interests of the UK and I’m quite sure that Britain will be happy to play this role, because this will make it more influential, and, of course, more interesting for other countries. That’s why it is quite a logic move. But the first thing, the British, of course, they are thinking about themselves, because for them good relations with the U.S. are crucial. SS: The British press is proudly implying that Theresa May got Trump to back NATO, keep sanctions on Russia - what do you think? Do you feel that’s true, does the British PM have enough influence to sway the American president one way or another? AY: It’s not about Trump, this is just the official position of Britain, they are repeating like a mantra that the sanctions should be continued and should be prolonged, and this is the official approach of the UK. Moreover, 2 years ago, that was Britain who initiated most of the sanctions - I’m talking about the economic sanctions, sanctions against the Russian MPs and some others. So, this is just the continuation of the old line, it means that Britain has the same stand, and we absolutely disagree with that, of course. But for us, it’s not the question for discussion. We believe this is the problem of Britain and the EU countries, of the U.S., and these countries should abandon sanctions because they imposed them. SS: But why is UK so afraid of normalising trade or of the normalisation of U.S.-Russia ties? AY: The different U.S.-Russian relations will be a game-changer in the world. That’s why every country should find its place in this big chessboard. That’s why, probably, the press in the UK is so nervous about that. But that’s the process. If you look at the British statements and articles in the press about other countries, you will find the same situation. So, Russia is not an exception in this case. SS: Let’s say Trump does push through an easing of sanctions against Russia - do you expect the UK to follow Washington’s lead? Or will London stand firm against Moscow? AY: It’s difficult to answer. Britain has its own interests and we don’t know what will be the political solution. I’m not going to speculate on that. We will be happy to see Britain changing its position. I think this will be in the interests of the British people. SS: May was the first to pay Donald Trump a state visit, the two were even seen holding hands - how will this new chapter of the ‘special relationship’ play out between the two? AY: Well, definitely, the UK is interested in relations with the U.S. and the normal way of things is just to have a political dialogue, exactly what we see now in Washington and also to have the President of the U.S. here in London. Despite the different points of view that you can hear in the Parliament, in the press - the official line of the government is to welcome Mr. Trump and I think it’s very important for the future of the British-American relations. SS: Ambassador Yakovenko, thank you very much for this interview, good luck with everything. We were talking to Alexander Yakovenko, Russia’s Ambassador to the UK, discussing the current state of the Moscow-London relationship, and where it’s headed in the changing global political climate. That’s it for this edition of SophieCo, I will see you next time.